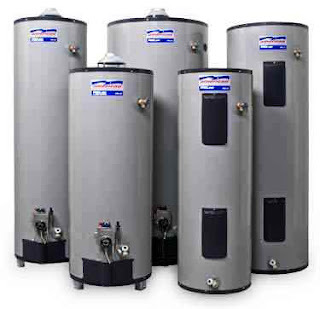 Most Domestic and commercial buildings need a service hot water system. Depending upon the type of building, this system could range from as small as an under sink water heater for washing hands to a 10,000 gallon hot water storage tank system used in a hospital laundry. 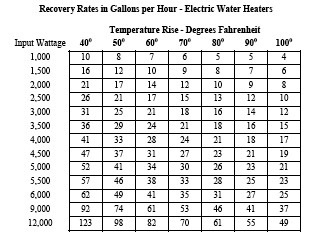 This Article is intended to help designers to choose the appropriate type and calculate the required power rating for thee chosen type of Electrical Water Heater. 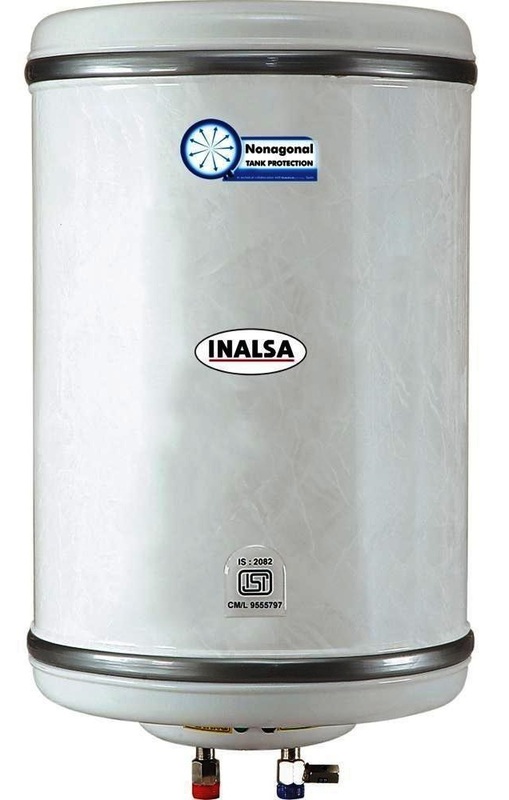 How to choose the best type of water heater for any application? With this brief, you will be familiar with the types and construction of common Water Heaters. Terminal hot water usage devices. The most important components are the first and second ones. 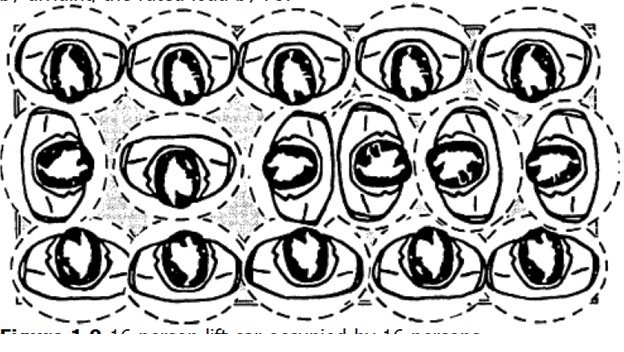 Indirect heat transfer (see Fig.3) uses heat energy originating from remote heat sources, such as boilers, solar heat collectors, cogeneration refrigeration or waste heat. 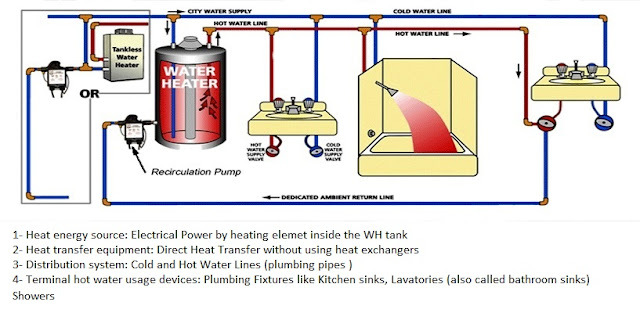 This type of heaters incorporates the burner, storage tank, outer jacket, insulation and controls in a single unit and is normally installed without dependence on other hot water storage equipment (see Fig.4). 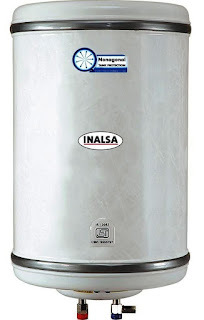 Fig (4): Typical Storage Water Heater (Tank-Type). They are available in electric, liquid propane (LP) and natural gas models. Natural gas and LP water heaters normally use less energy and are less expensive to operate than electric models of the same size. Small Storage water heaters (Tank-Type). They are typically vertical, cylindrical tanks, usually standing on the floor or on a platform raised a short distance above the floor (as in Fig.4). In houses they can be mounted in the ceiling space over laundry-utility rooms. Typical sizes for household use range from 75 to 400 liters (20 to 100 US gallons). Small storage tank water heaters, known as point of use (POU), utility or mobile home water heaters, are good choices for adding hot water to small buildings, shops or garages (see fig.5). These water heaters usually range in size from 2.5 to 19 gallons. The largest of these miniature units can also be used to provide hot water to secondary bathrooms that may be situated far from your home's main water heater. Tiny point-of-use (POU) electric storage water heaters with capacities ranging from 8 to 32 liters (2 to 6 gallons) are made for installation in kitchen and bath cabinets or on the wall above a sink. They typically use low power heating elements, about 1 kW to 1.5 kW, and can provide hot water long enough for hand washing, or, if plumbed into an existing hot water line, until hot water arrives from a remote high capacity water heater. 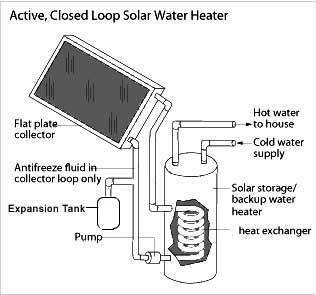 Storage water heaters (Tank-Type) have a special type which is the Solar water heaters. 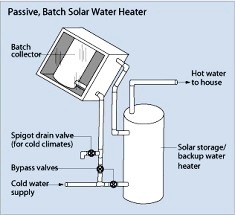 The potable hot water storage tank is typically a pre-existing or new conventional water heater, or a water heater specifically designed for solar thermal. The Indirect or closed-loop type. In this type (see Fig.7), the potable water is directly sent into the collector. Many such systems are said to use integrated collector storage (ICS), as direct-gain systems typically have storage integrated within the collector. 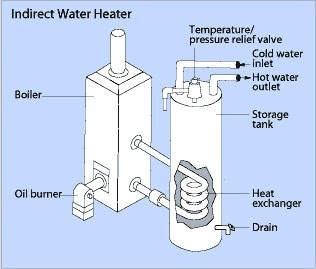 Heating water directly is inherently more efficient than heating it indirectly via heat exchangers, but such systems offer very limited freeze protection (if any), can easily heat water to temperatures unsafe for domestic use, and ICS systems suffer from severe heat loss on cold nights and cold, cloudy days. This type does not allow potable water through the panels, but rather pump a heat transfer fluid (either water or a water/antifreeze mix) through the panels (see Fig.8). After collecting heat in the panels, the heat transfer fluid flows through a heat exchanger, transferring its heat to the potable hot water. When the panels are cooler than the storage tank or when the storage tank has already reached its maximum temperature, the controller in closed-loop systems will stop the circulation pumps. 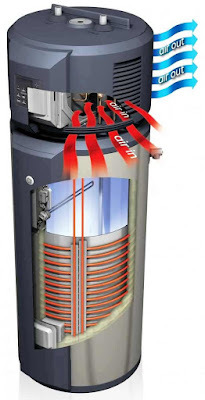 They can called also on-demand water heaters, this type of heaters has minimal storage capacity, they do not store hot water; rather they Heat water as it passes through a series of coils in the unit (see Fig.9). They are available in electric, LP and natural gas models. Most tankless units can provide up to 3.5 gallons of heated water per minute. They usually include a flow switch as part of the control system. 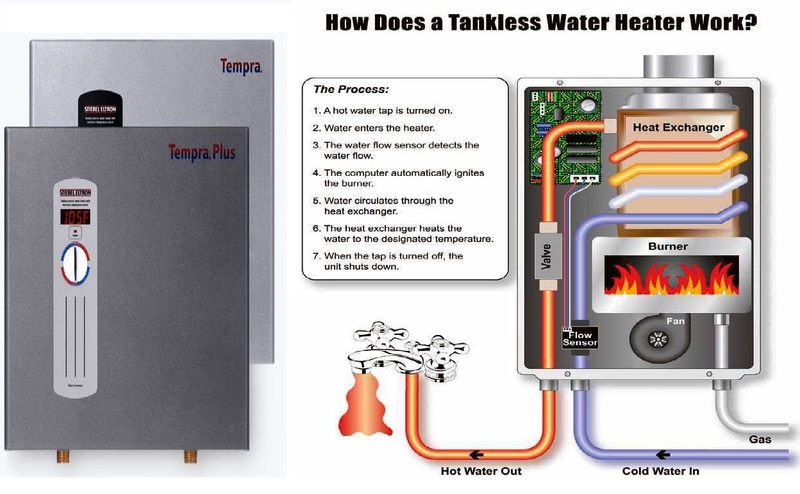 Tankless, instantaneous water heaters are best used for a steady, continuous supply of hot water. Tankless heaters may be installed throughout a household at more than one point-of-use (POU), far from a central water heater, or larger centralized models may still be used to provide all the hot water requirements for an entire house. Since the unit only heats water as you use it, a tankless heater is usually more energy efficient than a traditional storage tank water heater. Common types of water heaters can't supply hot water at more than two points at a time. 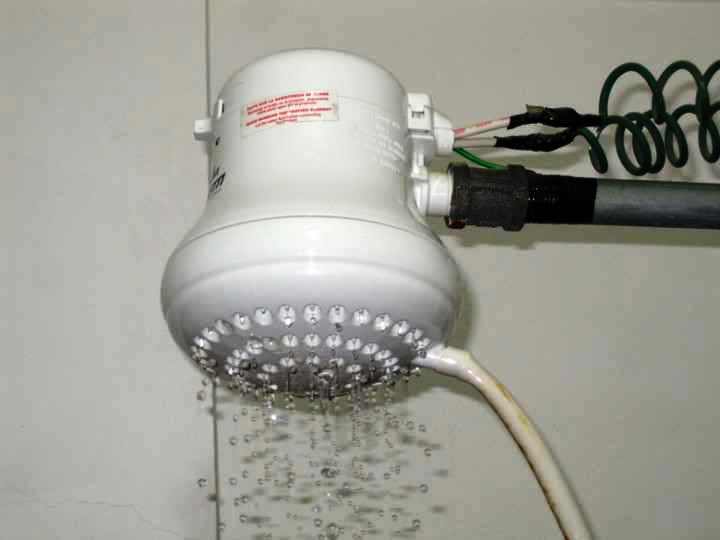 An electric heating element is incorporated into such shower heads to instantly heat the water as it flows through (see Fig.10). Electric showers have a simple electric system, working like a coffee maker, but with a larger water flow. A flow switch turns on the device when water flows through it. Once the water is stopped, the device turns off automatically. An ordinary electric shower often has three heat settings: low (2.5 kW), high (5.5 kW) or cold (0 W) to use when a central heater system is available or in hot seasons. A hybrid water heater (see Fig.11) is a water heating system that integrates technology traits from both the tank-type water heaters and the tankless water heaters. It Heats cold water via an electrical heating element and heat pump that pulls in ambient air and extracts the available heat. Dual activation: flow sensing and thermostat control. Hybrid water heaters can be gas-fired (natural gas or propane), or be electrically powered using a combination of heat pump and conventional electric heating element. 3- How to choose the best type of water heater? 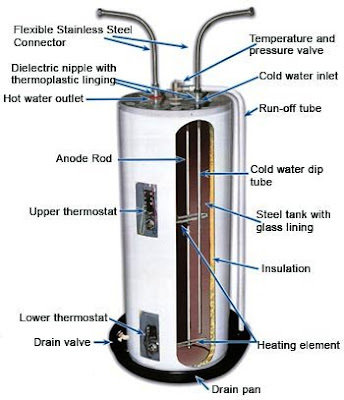 Volume Storage water heaters (Tank-Type): Typical sizes for household use range from 75 to 400 litres (20 to 100 US gallons). Small Storage water heaters (Tank-Type: range in size from 2.5 to 19 gallons. Tiny point-of-use (POU) electric storage water heaters with capacities ranging from 8 to 32 liters (2 to 6 gallons). Instantaneous water heaters (Tankless-Type): Most tankless units can provide up to 3.5 gallons of heated water per minute. 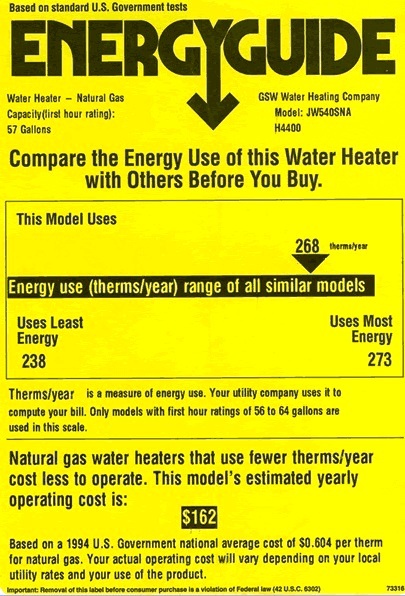 Hybrid water heaters: Typical sizes between two gallons to 20 gallons. Each offers unique advantages, and you can compare features and benefits in the table below. Stores hot water regularly in a tank sized to suit the users requirements. They do not store hot water; rather they Heat water as it passes through a series of coils in the water heater. Heats cold water via an electrical heating element and heat pump that pulls in ambient air and extracts the available heat. Heat pump delivers more hot water, up to 33 percent faster than standard electric water heater. Each type is explained in detail in above paragraphs. Not affected by power outages (tank-style only). 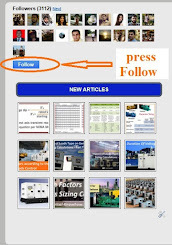 Offer high energy factor ratings. 8700 BTU/h compressor is the most powerful in its class. It is the amount of gallons or liters of hot water that the water heater is capable of providing in a given period of time (hour or minute). 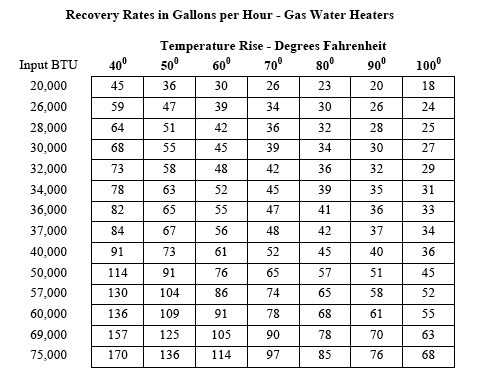 So, The greater your demand for hot water, the higher recovery rate you need. GPH (Gallons Per Hour): The amount of water, in gallons, that is used each hour by the plumbing fixtures and equipment, such as dish machines. GPM (Gallons Per Minute): The amount of water, in gallons, flowing through a plumbing fixture or through an instantaneous water heater per minute. BTU (British Thermal Unit): The quantity of heat required to raise the temperature of one pound of water one degree F.
Hybrids offer a narrow 21-inch diameter for access into smaller locations. Whichever fuel source you use, a water heater can be the third largest energy user in your home, so you’ll want a unit that offers energy and cost savings. Fortunately, almost all water heaters offer increased efficiencies to meet increasingly strict federal energy standards. Energy factor EF and yearly operating costs can be found on the Energy Guide label on the unit (see Fig.12). Energy factor EF measures how efficiently a unit converts energy into heat as well as how much heat is lost during storage. The higher the energy factor, the more energy efficient the water heater is. Look for EF ratings as close to 1 as possible. Electric heaters tend to have the highest EF ratings. 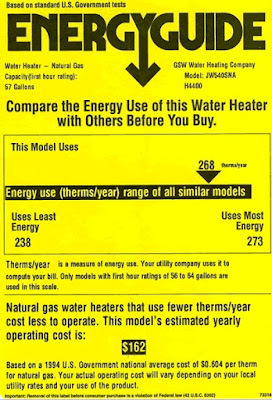 In the next Article, I will explain in detail the Sizing and Power Rating Calculations for Electrical Water Heaters. So, please keep following.